Hurricanes. Fires. Floods. Tornadoes. We’ve had many natural disasters, and far too many people have been impacted. It’s a heartbreaking situation. When you’re ordered to evacuate, usually you have very little time to pack and flee. If your local emergency management official told you you had thirty minutes to leave your residence, what would you take? What could you leave behind? This isn’t a post about disaster preparedness – you should familiarize yourself with it. This is about ridding yourself of the excess stuff around you. This week I’m tackling paper. Part one of I don’t know how many parts. While cleaning out a closet last week, I found an accordion file from 1998. I’ve kept a file like that each year for the past 30 years – bills, receipts, cancelled checks. This one, from nearly 20 years ago, must have missed the shredder. I keep my records for seven years. Look at my cable bill! That included my phone, too, but not internet. In light of the massive Equifax data breach, I wonder why I worry about shredding old documents. I also cleaned out the refrigerator. Even though we don’t live with the constant threat of hurricanes or tornadoes, we’ve lost power (more likely in a winter storm), and when you lose power for a prolonged period of time, you might lose what’s in the fridge and freezer. My husband is the Condiment King. I cleaned out near-empty jars of salsa, bottles of ketchup and soy sauce. I know I’ve been all over the place with this project. I could have stuck to cabinets and drawers until everything was cleaned out, but I’ve jumped around – closets, paper, furniture. Bit by bit, week by week, decision by decision. Yes, with all the news from Equifax, shredding seems trivial. (Grrr!) But the purging feels great, nonetheless. And your condiment crowd did make me laugh! Just follow your heart. It will get done eventually. What I clean depends on where I am when the MOOD hits me! I have a friend who even shreds those address labels. I told her that there was everything I needed to know about her on the internet, which is how I found her anniversary date. Thanks to you I cleaned out the closet and yesterday had a huge pile n the porch for Purple Heart. I try to clean bottles out of the fridge once a month. Jumping around might make the task less heinous. A bit at a time and it gets done. 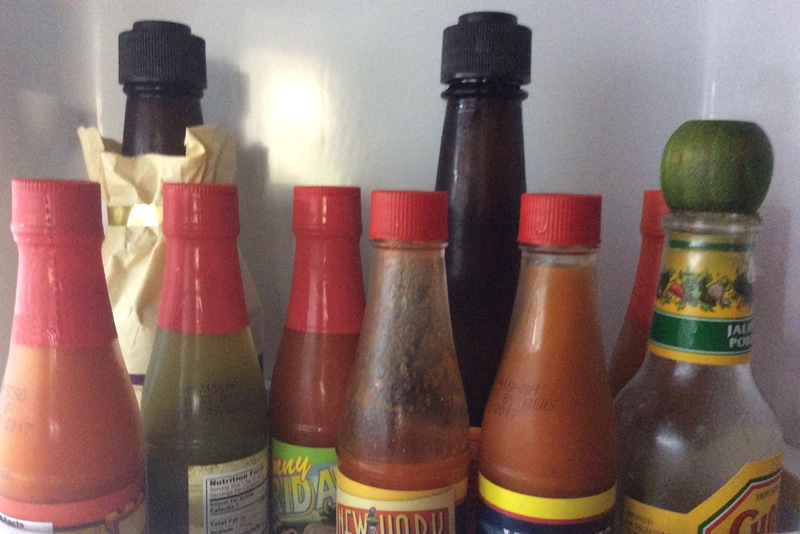 I clean out the refrigerator and food cupboards regularly, checking for expiration dates. That is one job that doesn’t get overwhelming. Same with paper. My problem is books (surprise, surprise), clothes, and kitchenware. I started bringing a few things to work, leaving them on the counter with a “Free to a good home” sign. Guess what. They disappear. Win/win. I get rid of them and they don’t get tossed into the landfill. Small victories. By the way; I saw you f/b share of “The Minimalists” and liked the page. Also “Living Minimally,” or something like that. I’ll take the help where I can find it. Your project may be paying forward. Thanks, Connie. I look into the garage every day, and know it awaits me. I won’t tackle it until the weather is cooler and I’m more healed from my little surgery. But it’s there, mocking me. My work area is also a mess. I may not be able to share its ‘before’ picture, I’m so embarrassed by it. But I know where everything is!